Deputy Governor H.E. 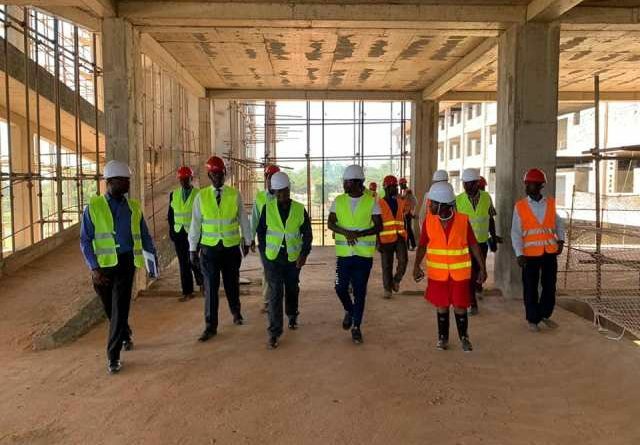 Prof. Philip Museve Kutima was today impressed by the ongoing construction works at the upcoming New Kakamega County Teaching & Referral Hospital during a site inspection tour of the facility. The deputy governor called on the contractor to ensure timely completion of the facility and reiterated the county government’s commitment to improve the standards of health services in the county. Some of the sites visited include all the facility’s floors, the theatre room, lifts for clients, food stuffs and drugs, the plant area, the emergency unit and sample rooms among others. Chief Officer Health Projects, Dr. Brenda Makokha said the progress status of the facility was on the right course. Meanwhile, the Ministry of Agriculture, Livestock Production, Fisheries development and Cooperatives today got a big boost for its activities when a development partner, GIZ, presented a vehicle to the deputy governor who is also the ministry’s CECM, H.E. Prof. Philip Museve Kutima at the county headquarters. Prof. Kutima thanked GIZ and expressed optimism that Kakamega county is on the right path towards implementation of food security programmes as a pillar under the National Government’s Big Four agenda that is also within the mandate of county governments. Giz has continuously supported the county government of Kakamega through capacity building. According to its Food Security project coordinator Mr. Kenda Mwencha, the organisation shall continue partnering with the county in agricultural activities to improve the county’s food security. Present during the events were Health Projects Chief Officer Dr. Brenda Makokha, her Agriculture and Cooperatives counterpart Mr. Jeremiah Namunyu, Chief of Staff Robert Sumbi, Mr. Titus Omengo and Mr. Evans Asena of GIZ among others.